The Wisbech and Upwell Tramway was a rural standard gauge tramway in East Anglia. It was built by the Great Eastern Railway between Wisbech, Cambridgeshire and Upwell, Norfolk to carry agricultural produce. Six trams a day in each direction provided passenger services, with the full one way journey taking one hour. By October 1884 traffic had grown to 3000 passengers per week, with peaks of 2000 in a day for fetes and other special events. Its success was one of the reasons for the Light Railways Act 1896. Competition from motorised buses ended passenger services in 1927, but freight carried on until 1966 when it was cut as part of the Beeching Axe. Originally the line used GER Class G15/LNER Class Y6 0-4-0T tram engines, which in accordance with Board of Trade regulations had sideplates and cowcatchers. These were replaced by more powerful 0-6-0T GER Class C53/LNER Class J70 and later by Drewry 0-6-0DM (Class 04) shunters. For a short time in 1930-1931 two LNER Class Y10 Sentinel geared steam locomotives were used. The route carried it close to farms and villages, allowing goods to be shipped into Wisbech where they could be transferred onto the main line and carried to destinations further afield. Its Upwell depot was 5 miles 72 chains distant from Wisbech East Station. During the fruit season the sidings could hold more than a hundred vans. The depot at Upwell had a cattle dock, a depot office, a passenger waiting room, and a coal merchant's office and staithes. From the Upwell depot, which was the southern terminus of the tramway, the trains headed northwards to the village of Outwell and then picked up the main road to Wisbech, which it ran alongside, unfenced, and crossed several times. Stops were frequent and the stations really little more than glorified bus shelters. If you know what to look for, there are even now signs of where the tramway passed. The Rev. W. Awdry, one time vicar of Emneth, drew much inspiration from the tramway which passed his house for the stories in his 'Thomas the Tank Engine' books. 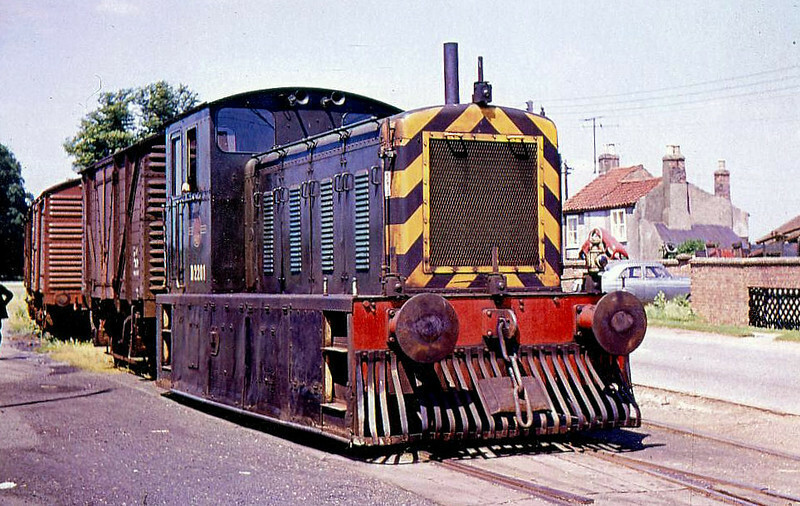 Toby and his coach Henrietta were based on stock used on the tramway. In the 1970's, the house I lived in was only about 50 yards from the trackbed and I have always had interest in the Tramway. These pictures are published for pleasure/information/research purposes only and are not for sale or copy under any circumstances. Information in captions has been researched as thoroughly as possible but its accuracy cannot be guaranteed. Class 04 - D2201 - Drewry 0-6-0 DM Shunter - built 1952 by Drewry Engineering - withdrawn 04/68 - sold to Barnsley & District Coking Co. - withdrawn 07/78 - seen here on the Wisbech & Upwell Tramway shunting at Elm Bridge in 1964.